To Love a Rose: Top 100 Baby Purees! Okay, so I have a quick minute; and I really wanted to blog about this awesome book I bought recently. 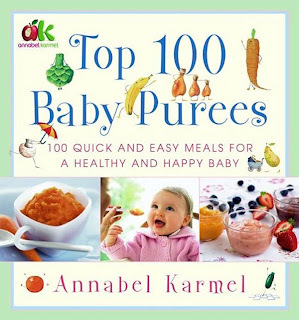 It's called Top 100 Baby Purees: 100 Quick and Easy Meals for a Healthy and Happy Baby by Annabel Karmel, and it's pretty much amazing! We have no real way of knowing how old Baby C will be when s/he comes home. When we get our referral, s/he could be anywhere from 3 months to a nearly a year - that could be the difference between breast (if I'm lucky enough to be one of the very few adoptive mothers who are physically able to breastfeed their adopted child) and/or formula and the beginning of "real food", as my own mother says. So, we're preparing for both possibilities. I have to admit, I was a little freaked out by having to figure out what to feed a near-toddler in regards to more solid foods; but Annabel leads you through not only tasty meals that most babies love, but also foods that are high in all sorts of minerals, vitamins, and good fats and proteins to help baby's body and brain grow to their healthiest potential - hooray! It took a load off of my mind for sure! Heck, some of her ideas looked so yummy, I was tempted to whisk some up for Mr. C and I! "Salmon Surprise"? Uhh, YES please! The most important thing Mr. C and I have talked about is that we are expecting to expect nothing on this journey; which I think is a really good outlook for prospective parents to have when adopting internationally. So, even when it comes to food, we are just going to go step-by-step and day-by-day knowing that things can always change or not work out. I'm actually really looking forward to making Baby C homemade baby food, though! My mom was a warrior woman - she stayed at home with three little girls, planted a garden every year, canned veggies and fruit and meats from our own organic farm, and still had time to create art and craft projects, have a perfectly decorated home, and get us to our private school and all extra-curricular activities we were involved in as well! I hope I will be even half as amazing as she was and still is! Well, I need to get off of here! It's so easy to get caught up in "baby talk" these days! I hope you're experiencing a lovely day wherever you are in the world...it's a bit dreary here today, I must confess. Let's hope for sunshine and blue skies for tomorrow, yes? PS: Here's a link to Amazon where you can buy Annabel's book(s) and even download them to your Kindle - yay! I wish I had found this book for my own wee ones, but I totally agree. Homemade baby foods are super easy and more convenient and healthy than the jarred mass market brands.